This is the third post in a series on vROps sponsored by VMware. Check out part 1 and part 2. 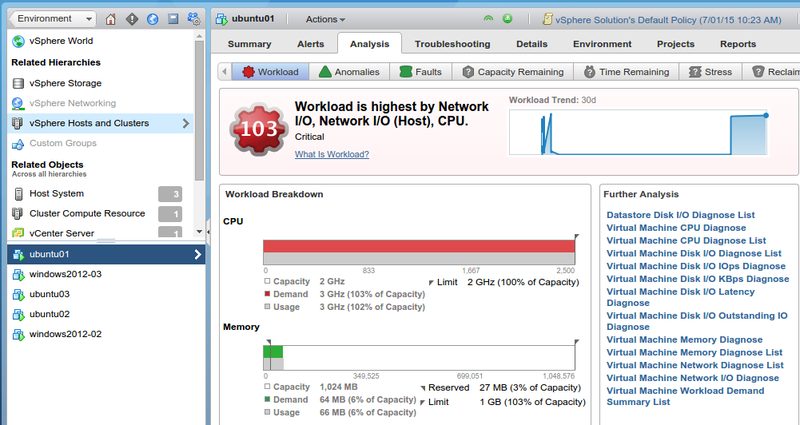 I’ve had vROps running in the lab for over a month now, and I’ve also been playing with it in Hands On Labs. Overall, it’s a good product, though not without its flaws. I thoroughly recommend signing up for a trial of the Hands On Labs version because you get to play with a fully configured version quickly. The out-of-the-box alerts and conditions and so on are good. They handle a lot of the major situations admins are likely to encounter, like CPU capacity constraints, memory limits, that sort of thing. The trend analysis is fine, though I wonder about things like long-term seasonality (end-of-month or end-of-quarter reporting, for example) and the simple traffic light system is easy to understand. The integration with vSphere means you can act on alerts from right there in the tool. It means you can implement a Lean/TPS continuous improvement approach to things. When you see a new situation, you can add an alert and include the solution so that if it ever happens again, you don’t have to remember what you did six months ago (and go hunting for the link to the StackExchange post with the answer), you can just read the suggested solution, think “oh yeah, that’s right” and click on “Add more memory” or “Move VM” or whatever it is you need to do. I like the way trends are displayed as simple coloured blocks and sparklines, and how you can drill into all the different aspects of the environment. The obsessive detail nerd in me loves being able to look at all the different statistics to see what’s going on in the environment. The interface is consistent with the way you work with vSphere, so you feel right at home. Now this is probably because I hadn’t configured something properly, but that’s a tad confusing. Why do I need to do anything for this to show up on the main dashboard out of the box? Sure, one VM becoming CPU constrained shouldn’t send the entire environment into a Red alert status, but I was expecting to see something about it in the list of Recommendations on the home view. I suspect that, like a lot of things with vROps, the key is learning to think in the way the tool does. What’s the difference between vSphere World, Universe, and Environment? When does it matter? This is a tool for large and complex environments, with a team who are willing to spend time learning to use the tool and configuring it just so. Once that’s done, they will have a great monitoring tool that keeps them well informed of what’s going on in their virtualised environment — VMs, storage, networks, the lot. It feels large and featureful, which is good, but also confusing. I can’t see smaller IT shops with a handful of hosts going anywhere near this tool; it’s just too complex for them. What I’d love to see is more work done on the user interface to simplify it based on what people commonly need to see. It feels a bit too cluttered, like it’s trying to show you all its wonderful features at once, which just feels overwhelming. However, I also hate tools that are stuck permanently in novice mode, as they just get in your way when you’re an experienced user. Getting the balance right between ease-of-use and functionality is hard to solve, even more so if the interface needs to change as the user becomes more experienced. Which says more about me than about the tool, to be honest. A pipe-organ has lots and lots of keys and knobs and buttons, and with a novice at the keyboard, it’s all rather overwhelming. But for an experienced player, every knob has purpose, every key is where it should be, and you can make beautiful music full of subtle complexity. vROps is a serious business tool, not a toy.